Contributions from 2,017 euros can also be determinant from those who can afford it, both personally and collectively or anonymously. In addition to the rewards written above we can not think of anything else, but if you think you can bring more you're welcomed. Each euro will be invested to achieve the above objectives. Dedicated exclusively to the process:to obtain documents and evidence from annual accounts, commercial registers, etc., draw up the lawsuit and other legal documents; participate in the interrogation of senior managers to be charged (we estimate between 16 and 80), among other tasks. Specialized team for work related to the selection and analysis of economic and legal material and its translation to understandable and useful documentation for the court case and for popular understanding. All trips planned and predictable for shareholders and lawyers to court for a year. Attorney cost or the process. This initiative is part of a team organization representing different organizations and groups, with people volunteering time and energy investing in a new process. If we get monetary support of the minimum cost defined here we will strategically invest it where it is most urgent or important. Goteo.org crowd funding platform applies an 8% rate for their services on successfully co-financed projects (adding about 1% for the payment gateway). Detail of activities to help maintain this contribution are technical (i.e. incident and payment management), administrative (contract and legal advice) and services (counselling for campaign design, communication or assistance for users). 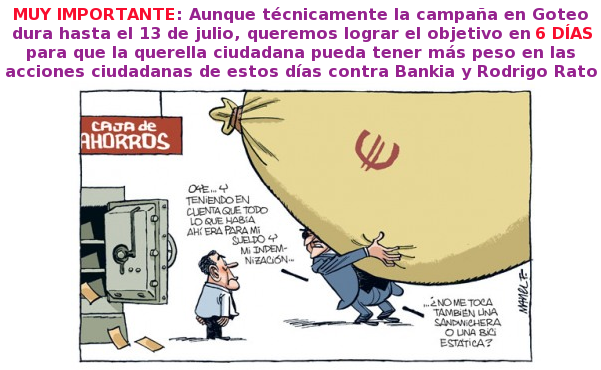 On July 20th (2011), an exultant Rodrigo Rato presented Bankia’s IPO ensuring that the entity intended to “grow and create sustainable profit”. The shares traded that day at 3.75€. With a millionaire advertising campaign, Rato grasped the savings of many people, convincing them that they could be ‘Bankers’ too. Only 10 months later, this financial monsters’ shares sell for 1€ and day by day a billionaire hole grows. A hole no one wanted to see, neither Rato, nor his Board of Directors, nor Deloitte who audited the accounts, nor the National Stock Exchange commission who authorized its IPO, or the Bank of Spain. Today Rato’s whim is a state problem; the rescue his friends and political party colleagues have promised will cost us all a bomb, even though we are not Bankers, we don’t receive the bonuses or succulent dividends they have pocketed or have millionaire pensions. Rato resigned as president of Bankia, but despite his bad management, he continues occupying Caja Madrid’s presidency, without stating if he will give up this position. How was this scam created? Why did they allow such a giant hole to be made public? How did they cover up numbers? Obviously, there is something wrong here, and Rato should be one of the ones held responsible for this. Consequently, citizens organized around @15MpaRato (http://15mparato.wordpress.com/) have decided to put forward the first citizen lawsuit against banks. Impunity has come to an end! We will undertake criminal and civil actions against members of Bankia’s Board of Directors, at the time when it was chaired by Mr. Rodrigo Rato and against the Board of Directors of the Financial and Savings Bank, for endorsing on the State a toxic and ruinous matrix. We demand prison and seizure of assets for a value equivalent to the amount obtained with the irregular placement of shares 400,000 investors have been misled, many of them with savings in this bank. Seized money has now mysteriously disappeared, dragging the country to an imminent bailout. The Spanish Constitution, in its Article 119, establishes that justice shall be free when stipulated by law and, in any case, for those who have insufficient means to litigate. In our case, we are certain putting Rato and others responsible for Bankia scam in prison will not exactly be an initiative that will be supported by those who make the laws. Nor will it help to show we do not have the huge amount of financial resources required for a lawsuit of these dimensions. Therefore, we will not be able to rely on the state’s instruments; we do not even really trust them. Furthermore, they believe we can’t do it because we do not have the money. But they do not have in mind that there are many of us and with a small contribution from each one of us, we will succeed. Since this process may have several phases, we will need funding at different times. The objective is to collect funds to finance the first phase of the lawsuit, hoping it is the only one but knowing that very likely it’s not. The first step is to file the lawsuit itself. That is; contact those affected who want to be part of the case, receive their statutory powers, find irrefutable data and witnesses, draw up the lawsuit, deliver and monitor it, prepare at least 16 interrogations (probably more) and other unforeseen issues. If we want to file a lawsuit we must have in mind that just doing it costs about 15,000€ (see breakdown below and in section/ Needs). This is where we want to go with this collective financing campaign. In theory, all investigations required afterwards are carried out by the state. But we know that, if we want things do be done properly, we will have to collect more money to hire independent auditors and investigators. The final cost of hiring independent auditors could range between 30,000€ and 80,000€ for a research and analysis job of several months and a lot of documentation (we are probably talking of about 80 indicted). So far, we are in the game just filing the lawsuit. And they are already nervous. With citizen pressure we can try forcing state auditors do things right, and with this avoid having to hire independent auditors. We note that when preparing the budget, we have not based ourselves on what is normally done in these cases, ie calculate a 7-10% of the amount that is in issue, or that is at stake and wants to be recovered (this would be incalculable and absurd), nor have we relied on the Guidance fees Schedule of Madrid Law School, which provides guidance for the guild rates. We have built costs based on the minimum wage established for Spanish citizens (641.40€ in 2012), even though we do not consider this to be a fair wage in the context and time we live in. For at least a year, a legal team that is dedicated exclusively to the process:to obtain documents and evidence from annual accounts, commercial registers, etc., draw up the lawsuit and other legal documents; participate in the interrogation of senior managers to be charged (we estimate between 16 and 80), among other tasks. The estimated budget is 6,000€. Always for at least one year; another specialized team for work related to the selection and analysis of economic and legal material and its translation to understandable and useful documentation for the court case and for popular understanding. Around 3,800€. All trips planned and predictable for shareholders and lawyers to court for a year can cost around 3,000€. Attorney cost or the process 1,000€. Statutory powers for shareholders about 200€. The intention is that costs are zero for shareholders, not even the statutory powers; this action does not seek money but justice.. If money comes, welcome, the more we will have to persue others responsible for the crisis. Goteo.org crowd funding platform applies an 8% rate for their services on successfully co-financed projects (adding about 1% for the payment gateway); the estimated total amount is 1,242€. Detail of activities to help maintain this contribution are technical (i.e. incident and payment management), administrative (contract and legal advice) and services (counselling for campaign design, communication or assistance for users). For all stated, we have launched a collective fundraising campaign to find the money needed to open file the lawsuit as soon as possible. Campaigns in Goteo.org last 40 days, but we need to raise the amount in 6 days (1,000 people, 15 euro each! Yes we can!). The money will be transferred in 40 days from the Open Source Foundation (Goteo.org) to the lawyer’s account, responsible for the case (see biography below). The amount is shown on the campaign’s page in Goteo.org and on http://15mparato.wordpress.com/ Everyone can know exactly what has been raised. On the Website 15mparato you will also be able to see, in a special section for it, all information on expenses incurred and the accounts of the whole process, including all invoices generated (scanned). We believe in transparency. If money is left over and/or when it is recovered, we will prosecute others responsible for the crisis. This initiative is promoted by different people and groups very active in the Network, coordinated anonymously on this occasion to pursue the lawsuit effectively. The initiative is open for every citizen to make it theirs and spread it, post it on their forums and support it. To file the lawsuit, we needed affected shareholders willing to go ahead with the process. Only 12h hours after starting the search (#AcciónPaRato) we had over 50 willing and ready. We will obviously ask for protection of their identity. There are other similar initiatives started or announced by other groups/ collectives/ political parties, which we hope pursue justice being made, not political or advertising interests. But experience has taught us that only collective intelligence and people united can pull something like this forward, without hidden interests. Here we are! ICAS Collegiate 10943, Seville University law degree. Practices law in Seville, first as a founding partner of Yagüe & Senra Lawyers firm and independently since 2010. He was also appointed deputy judge of the courts of Aracena and substitute attorney in Soria. Specializes in procedural law, civil law, criminal and commercial law, insolvency and contractual law and banking legislation. Promoter of the legislative initiative “Democracy 4.0″ in 2008, registered in the Parliament in 2010. 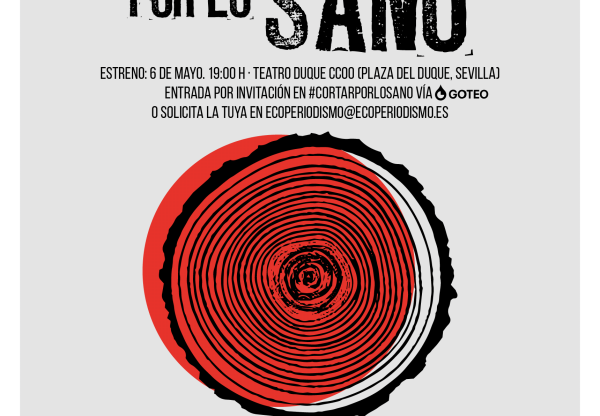 Sponsor of an#opEuribor an #tomatubanco initiatives. This person will assume at all times legal responsibility for the decisions taken. From shareholders to the people who have spread this campaign, the legal team or the auditors, we all have a role in this adventure of the people against the banks. Spread the word! We’re going for them! We're going to prove that people united and working together is stronger than any oligarchic caste. We invite organizations and groups to join us and give more strength to this initiative spreading it, networking and carrying related actions, etc.